Three years ago I wrote a post about my friends Margot and Christophe starting a sheep and vegetable farm in the middle of the Southern Alps. Having become a co-owner of the land they were using to let their sheep graze in the mountains, I had been feeling very guilty that I had not managed to go visit them for the yearly summer co-owners' meeting and lamb barbequeue. I was starting to fear that my friends and the other co-owners would start thinking I was a selfish and absent landowner, uninterested by the lives of the farmers on this bit of land I co-owned. 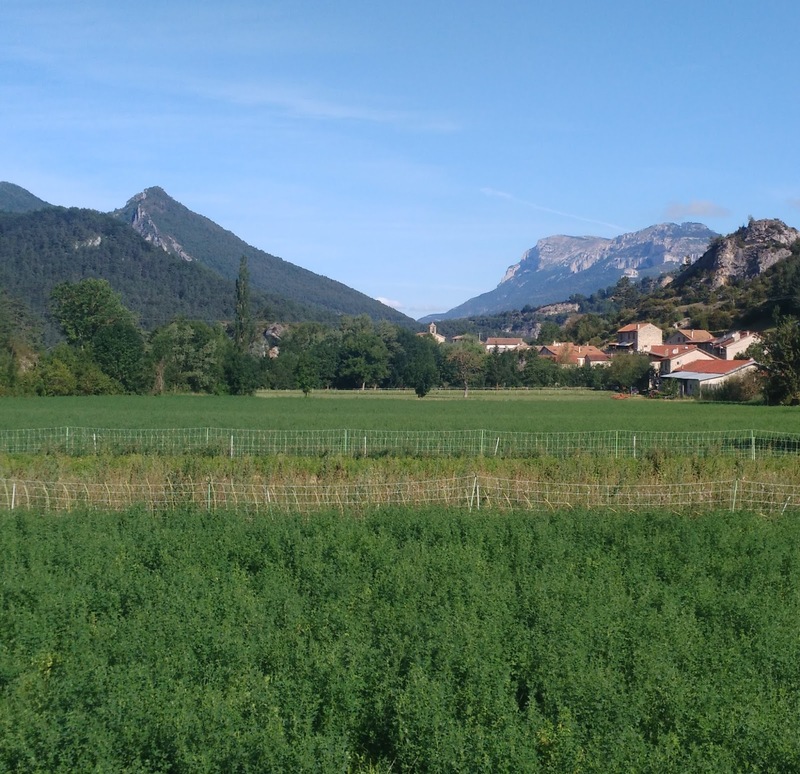 So this year I hired a car and drove across France from the Pyrenees mountains into the Alps through the Cévennes, Lozère and Ardèche mountains in the centre of the country. It was a beautiful road trip. I really enjoyed driving through the narrow windswept country and mountain roads. The landscape changed along the way East from agricultural fields to chestnut forests, pine and fir trees, and finally heather moorland just below the Mont Lozère. 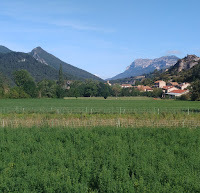 After dropping down into the Rhone Valley, I climbed back up into the Alps on the other side to enter lush valleys where farmers were growing the fodder their animals would need in the winter. In Glandage, although the paperwork for our co-ownership land association has still not been finished, the association has already bought the land with the monies we all invested. Margot and Christophe have thus expanded their farm: 0.8 ha give organic vegetables. They supply local villagers, their children's school canteen and an organic shop in the main town of the valley. Thanks to the land all their friends co-invested in, they now have 70 ewes (three got killed by wolves just ten days ago! ), which give birth to one or two lambs every winter. Likewise, the meat is sold in local marketing and processing networks. Margot also harvests the wool, which is of good enough quality to be processed into clothing yarn. But, they are much more excited by the possibility of clearing the trees from the mountainous pasture land to open up more land to grass, and using the funds left over to buy another smaller plot of land closer to their house where they could have the sheep graze in the spring. Finally, another young couple from Switzerland has moved into the neighbouring house and would like to join Margot and Christophe's farm business to improve the vegetables' productivity and possibly open a small processing enterprise to add value to the produce. I am keen to see how all this will develop in the coming years.